Jade Alarms and Securites Ltd is based in Preston, Lancashire and provide intruder alarm systems, CCTV, security lighting, door entry and access control systems for home and business. Over the past 27 years Jade Alarms has built a reputation of experience in the security market. From the initial free home or site survey, the free system design & quotation for the finest bespoke system, or the simplest of systems for the smallest of family homes, Jade Alarms can provide a complete package of electronic systems & solutions to combat almost any security risk. Our installation team are fully experienced in all aspects of domestic and commercial installations, building up over 5,000 installations during 27 years of trading. All systems are backed up by an optional service cover plan and emergency call outs and repairs are available. We are also happy to takeover the service and repair of non-Jade Alarms installations. 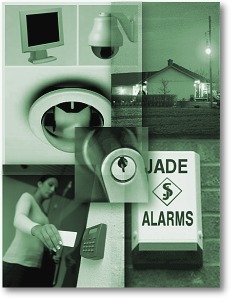 For total piece of mind, view out contact page for a cost effective solution from Jade Alarms and Securities.